This month, in the dog days of summer, I'm posting a weekly diary entry from a designer friend who travels the world for inspiration, fabric samples, and all the other myriad things a fashion company needs from abroad. For five days on her European spring trip, while sourcing material for Spring 2012, she took some notes and photos while working from city to city, and reported for us some current must-have looks and trends...and I'm looking for these now on 34th Street. Day Three…. Hang on to your Stripes. *If there were an ‘It Bag’ for the season, my vote would have to go to Prada’s bold stripe clutch. Stripes are seen in every bag silhouette: beach bag, hobo, weekender and the classic casual clutch. 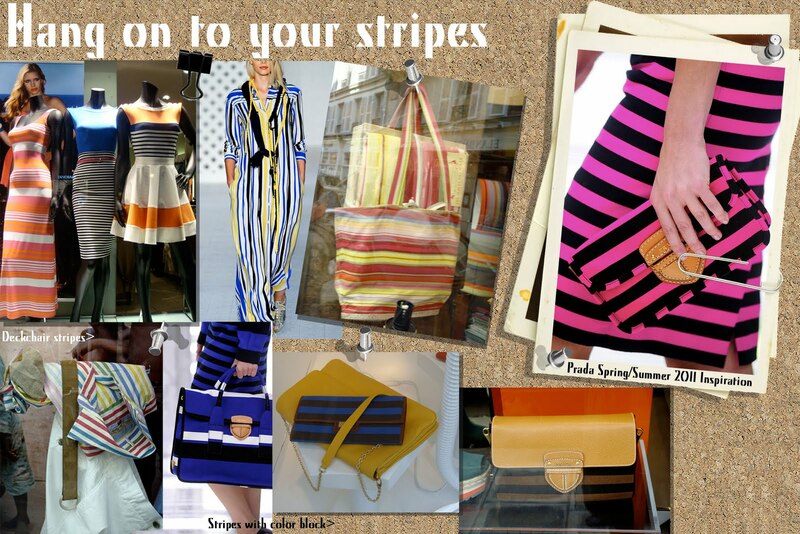 Bold colors and retro deckchair pinstripes are a fresh twist to brighten any spring outfit. Just give in already, as the stripe is it not just for summer but for fall this year as well. You've seen all the cool girls wearing stripes?! And then there are those of us who for years have had to curtail striped-top shopping for fear of ending up with an all-stripe closet. On 34th Street check out JCPenney Manhattan Mall for the very '70's I heart Ronson striped shirt, and for a more classic stripe go to Old Navy for the raglan boat-neck sweater.